Pregnancy brings a wide variety of changes to your body. Many of them are incredible and like your growing baby bump and feeling your baby kick for the very first time. However, it can also bring along a lot of strange, uncomfortable aches and pains. Since this is my fifth pregnancy, I can recognize most of them. 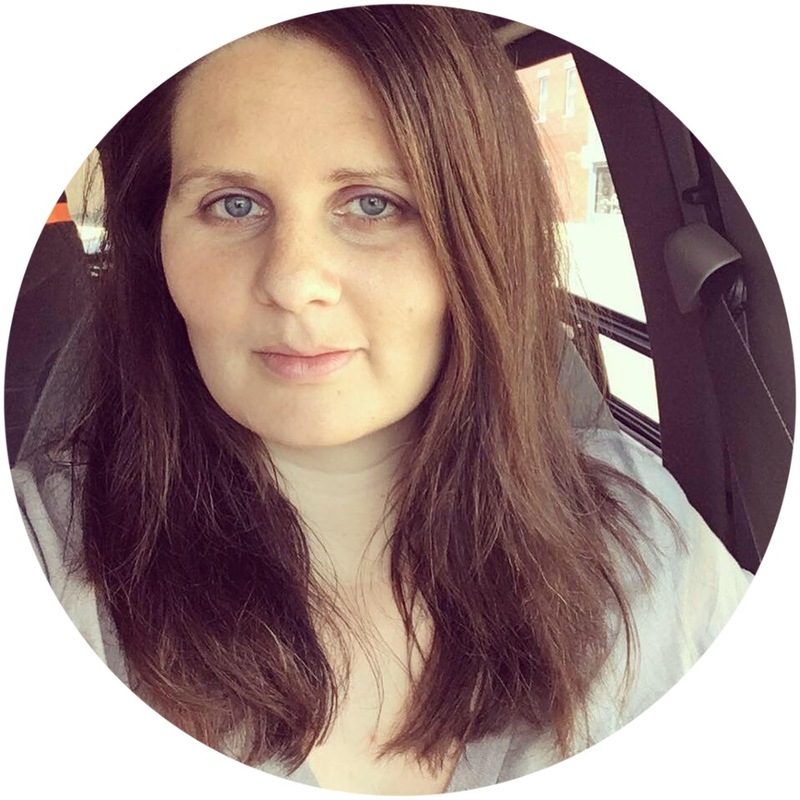 This time however, I've experienced something completely new and wanted to share with you what I learned. 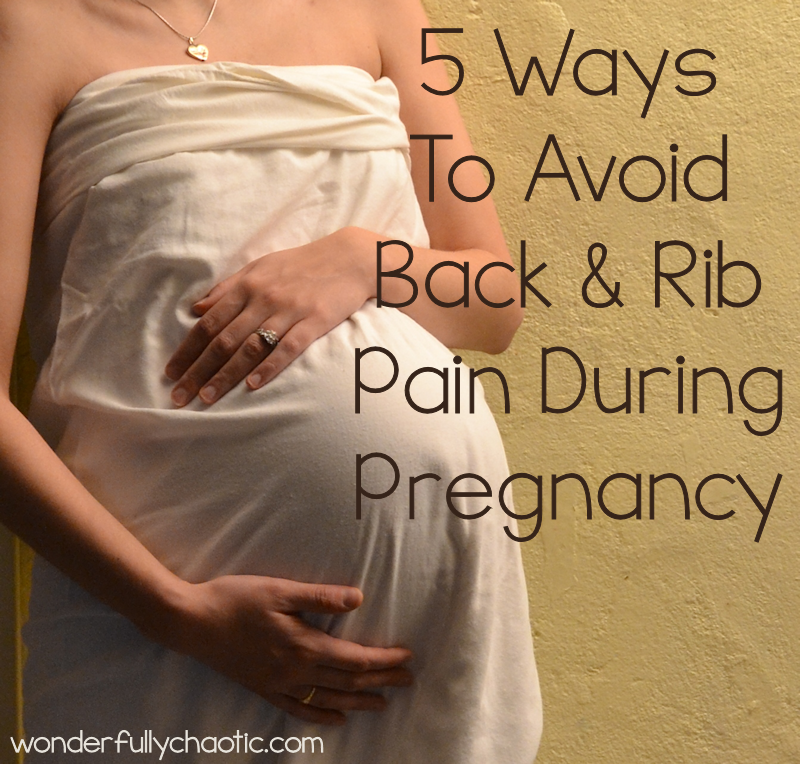 In the second and third trimester I (along with most women) usually experience some back pain. Most of this is from the growing baby and the changing hormones, and is mild to moderate. Over Halloween weekend I noticed a twinge in the middle of my back, radiating around my left side into the rib area. I chalked it up to the heels I wore on Halloween and figured it would be better the next day. Unfortunately it was not - instead it felt like a sharp jabbing pain whenever I moved, and the more I continued to do around the house the worse it felt. It hurt to touch and got to be so bad that I couldn't get comfortable even sitting in a chair. I ended up going to bed extremely early one evening only to toss, turn, and moan. 2. Bend and lift correctly: I'm sure you've probably heard that old adage - "lift with your legs, not your back." Well, it's true! When you lift using your back, you're just asking to pull or strain the muscles in it. Squatting can be gentler as can bending with your knees. Try to avoid lifting heavy things. That is a hard one for me since I have two small children who do require lifting at certain times. I relied on babywearing a lot and it was extremely helpful, but unfortunately I've had to "hang up my carriers" for the moment. I have an older child I have enlisted some what to help me during the day but have also made a point to have the toddler sit with me in a chair or on the couch, and have had to encourage him to independently do some more things, with me standing by to watch/help if needed. 3. Practice good posture - It may sound silly, but if you don't have good posture, you slouch or slump a lot, or if you have a lot of "comfy" furniture that you sink in, that is probably contributing a lot to your back and rib pain. I didn't really think about it at the time I started experiencing pain but one of our couches is very destroyed by the kids jumping on it "lived in" and you kind of sink into it when you sit down. It seems like comfy would be helpful but when I was sitting on it the other day I noticed that I was in a bit of a hunched over position. So: make sure that you stand up and sit up straight - this opens up your rib cage area more, strains your muscles less, and allows you to breathe more easily. Try not to stay in one position for too long - sitting or standing. Take breaks to stretch and to move. 4. Pillows and other support - And speaking of good posture, one thing that can help with that and with back pain in general is support. My comfy couch situation can be remedied by pillows, as can finding a comfortable sleeping position or sitting to nurse the baby. Full body pillows are great for sleeping and normal sized ones work for propping up baby when he needs to nurse or to stick behind my back/sides when trying to get comfortable sitting. Wear comfortable, loose fitting clothing. Underwire bras, restrictive or tight tops, and other form fitting clothing can make your muscles ache. Wraps or pregnancy support belts can be useful as well to help your belly and back - talk to your medical provider when trying to determine if you need one. 5. See a chiropractor - Finding a good chiropractor to help get you straightened out and adjusted is key. Mine told me lots of different things to do and I felt loads better the day after seeing him. I went for a follow-up appointment with him today and was amazed at how much I had improved in just a week, after almost a week of very serious pain. Even if you apply all these things I listed above, the chiropractor can make sure there isn't a more serious problem, diagnose exactly what your individual issues are, and will have good advice on things to do to help. Disclosure: I know I probably don't need to add this but just wanted to make sure you know...I'm not a medical professional and this is just my advice from things I have learned while doing my own research. 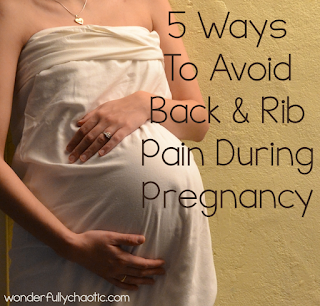 Please talk to your doctor, midwife, or chiropractor if you have back or rib pain during your pregnancy. I wish I had this excellent post when I was pregnant!! Thanks for taking the time to write this very helpful and clear post! 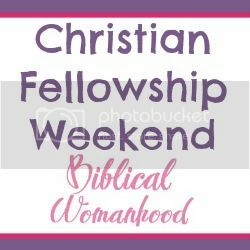 I am sure it will be a blessing to all who read it.